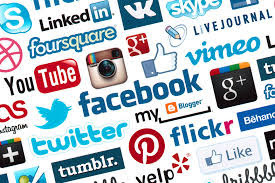 Putting the Tea in Teacher: Too much social media? There comes a point when everyone who uses technology asks themselves 'am I using (insert social media site) too much?'. Since joining twitter I have discovered how easy it is to record almost every thought you have each day above (and including) which type of coffee you fancy from Starbucks. But are our lives becoming over consumed by social media? The argument against: social media is only popular because people want and need it. As a blogger it's almost vital, and makes a huge difference to have a presence on twitter or Facebook. It's a great way to let people know about your blog posts and interact with other bloggers. I've even been invited to a blogger's meet up in my local town thanks to twitter. Social media also has practical uses. Facebook keeps you in touch with old school friends and makes it much easier to reconnect or arrange meet-ups. It's even possible to win prizes through social media sites and find out about websites or products you couldn't have otherwise discovered. The case against: do we really need to record every second of every day. Social media has become advertising, both personal and for products too. Thanks to social media, I know how far some guy who went to me school ten years ago runs and what route he takes. I am kept regularly updated with people's shopping habits. In fact, when I meet up with friends and they tell me the latest gossip I end up repeating the phrase 'yeah, I saw it on Facebook'. It is starting to become monotonous. On top of the key players there seems to be an app for every kind of social media. Photo sharing, text sharing, exercise sharing, sharing your to-do list, sharing your latest meal, the list goes on. Is it really necessary to record all this information? If you use all these apps it's almost like having a full time job filling them in. It's too much. On balance, use want you want. However, I do strongly felt that social media has become a way to advertise yourself, brag about the smallest achievements, and is making us all constantly 'on show'. Take the night off. Sit in your comfiest pyjamas and watch crap tv without feeling the need to broadcast it. In fact, if you're taking the time to tweet about it, it probably means what you're doing isn't that fun. Instead, get lost in the moment and forget about having an audience.